We will never escape the horrors of wars. After all, there are still rampant battles slaughtering populations and gutting civilisations. Wars are brutal and unforgiving, often at the expense of tours and tours of young people, pledging their lives to their country to defend it. It’s sad that we are still seeing warfare across the world, especially because we had two massive World Wars that we use as teaching tools for future generations. There have been countless amounts of films, television series, stage-shows, books, poetry, and art trying to showcase the horrors of battle. 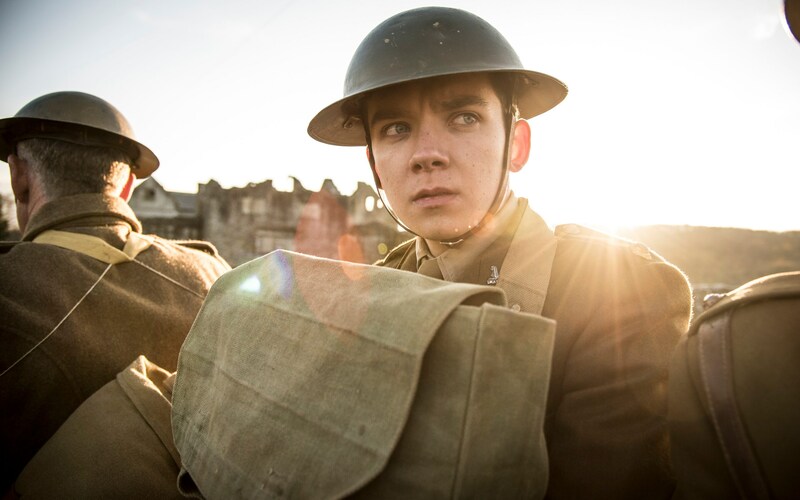 Out this week, Saul Dibb’s latest film Journey’s End is added to the list. Starring Paul Bettany, Asa Butterfield, Toby Jones, and Stephen Graham, Dibb’s suffocating and claustrophobic film is led by some of the best British talent. Each have their hand at playing officers or soldiers on the edge of horrors and death. Admirably, the cast rally together for often tense and highly-emotional scenes. No one really puts a foot wrong here and it’s brilliant to see them all flourish in such a great manner. That being said, Journey’s End is really Sam Claflin’s film and, honestly, if BAFTA Members had seen this film before the voting and not giving him the nomination he truly rightly deserves then it’s a crying shame. Claflin has proven time and time again that he is an actor with weight. Inhibiting varying and different roles, including hefty darker ones such as Stainhope, Claflin showcases an immersive talent that really inhibits the roles that he is playing. As Stainhope, he is a man with enormous responsibility that becomes progressively twisted and rotten due to the countless deaths of his men. This is a man who has seen horrors and attempts to wash them away with alcohol. Claflin layers him with fear, sorrow, and anger that filters through ever seen he is in. Curt and brutish with a somewhat kindness underneath, Claflin commands the screen with his indelible performance. Dibb’s work here is an intense one; the production design showcases the harsh conditions that thousands of men had to contend with. The story presents interesting views on heirarchy, especially with Butterfield coming in as a higher ranking soldier despite his lack of experience or age. There is definitely a class issue here and Dibb does well at bringing this forward. The film is flanked by an amazing score and gritty yet lush colouring in cinematography. Yet as brilliant as the performances are and great as the production is, this is a run of the mill WW1 movie and ultimately winds up with average results. Journey’s End is out 2nd February! Mute – Brand New Trailer! Duncan Jones is a gifted director who has crated some impressive movies such as Moon and Source Code. Now he looks to continue with the intriguing Mute. Classed as a spiritual sequel to his most revered work, Mute revolves around a bartender who is unable to speak but is searching through the streets of a futuristic Berlin for the love of his live. Starring Alexander Skarsgård, this looks to be an amazing future noir thriller, what do you think? Mute will be released on Netflix, February 23, 2018. Hereditary – Brand New Trailer! Every time a horror movie trailer lands on the internet, there are loads of article stating it to be the most terrifying trailer ever. Sure, jump scares can make you jump, but is it really that scary? Hereditary maybe. Coming from A24 and starring Toni Collette, Hereditary revolves around a family who start getting terrorised by an unknown entity after the grandmother dies. There are plenty of horrors on their way this year and this could be a good heavy-weight for being one of the better ones. What do you think? Hereditary is out later this year! Tom Clancy’s Jack Ryan – Brand New Trailer! Did you ever watch (the excellent) 13 Hours, but wished John Krasinski had a bit more to work with? Yes? Well, rejoice, because so has Amazon Video. So much so that they ordered a 10-episode series led by the actor and so Tom Clancy’s Jack Ryan was born. The actor will be taking up the mantle of the eponymous character, following the footsteps of Harrison Ford and, more recently, Chris Pine, to bring us what is arguably one of Tom Clancy’s most famous characters. Tom Clancy’s Jack Ryan premieres August 31st on Amazon Prime. Ant-Man and the Wasp – Brand New Trailer! The biggest question we all have post Infinity War is this – Where as Ant-Man and The Wasp? Now we have an answer with this brand new trailer but does it have a sting? The film is a sequel to the Paul Rudd fronted film but with Evangeline Lily as the other titular hero. The pair, naturally, have to thwart a villain of big proportions. Fans of the original movie will no undoubtedly love this one. And, for the first time ever, the US will be getting this MCU feature FIRST – a good month before we do in the UK. What do you think? Ant-Man and the Wasp hits cinemas later this year. When We First Met – Brand New Trailer! And then I saw it was from the creator of The DUFF, Ari Sandel. I had the same initial reaction and The DUFF is pleasantly surprising. So some interest has been piqued. Using a magical photobooth, Noah tries different versions of the night he met “the love of his life,” with varying results. This could be predictable or sweet or both but probably is going to melt into the background of Netflix this year. What do you think? When We First Met is out later this year!